July 14th was La Fête Nationale for France. Also known as Bastille Day, this national holiday celebrates France’s freedom from monarchial rule and coincides with the anniversary of the storming of the Bastille, a large French jail that was a symbol of the King’s power. Very similar to Independence Day in the U.S., Bastille Day is a day when national pride is on full display and is a perfect occasion for a picnic or soirée with friends and family. In commemoration of this French holiday, my family and I celebrated with friends over a vegetarian meal, wine and great music–all of which were French, bien sûr! To see what was included in our Bastille Day music playlist and hear excerpts from one of the albums at the link at the end of the post. As a vegetarian, I love and appreciate almost all fresh salads made with lots of greens and a simple vinaigrette dressing. 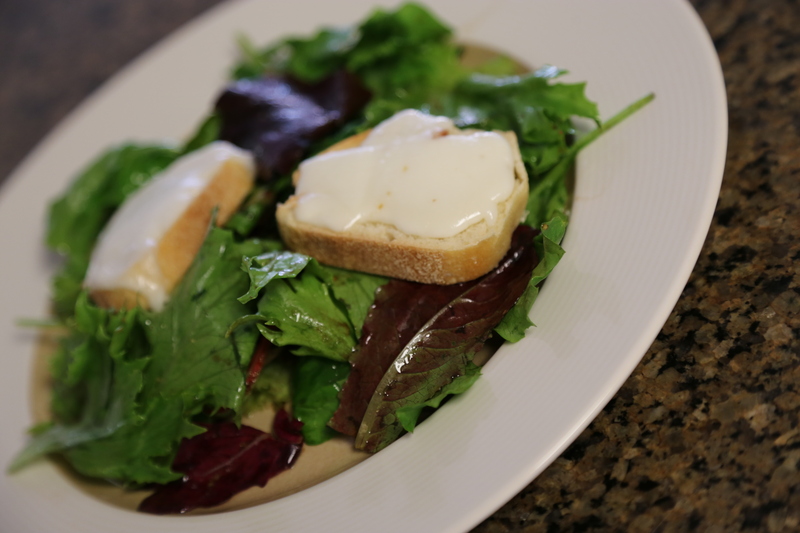 One of my greatest and simplest of pleasures is the opportunity to eat a nice warm goat cheese salad. This one consists of mixed baby greens with French walnut oil vinaigrette. Here, it is topped with goat cheese placed on sliced baguette, baked until warm. 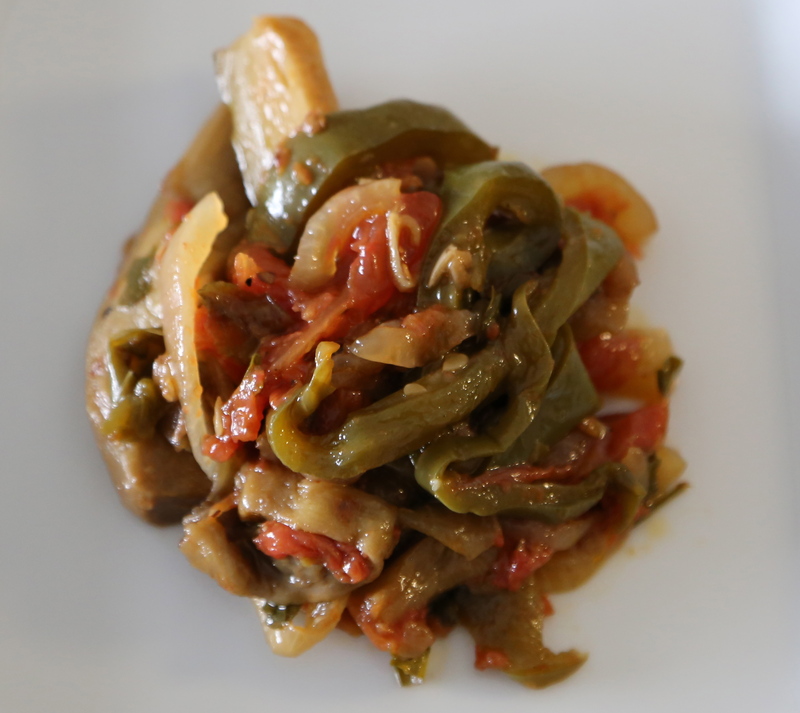 Ratatouille, a typical side dish from the Provence region of France, is perfect for summer as it showcases much of the season’s garden bounty in one dish. 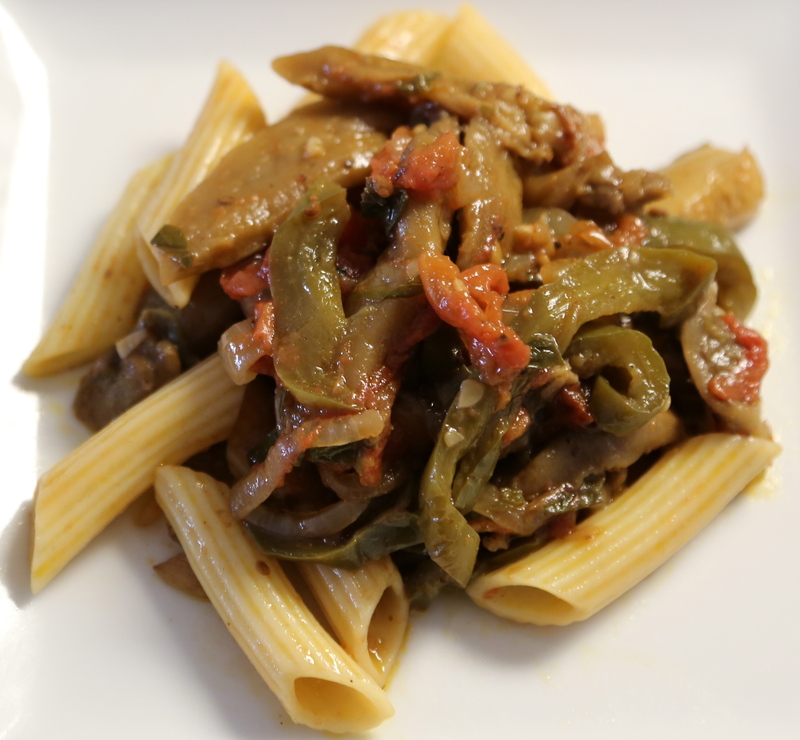 Wonderful flavors are brought out as the vegetables meld together. Julia was not kidding! It took me a few hours to make this dish. If you know you will be pressed for time the day you’d like to serve this dish, Julia advises to “happily” make it the night (or weekend) before. Although the work is long, the payoff is worth it. 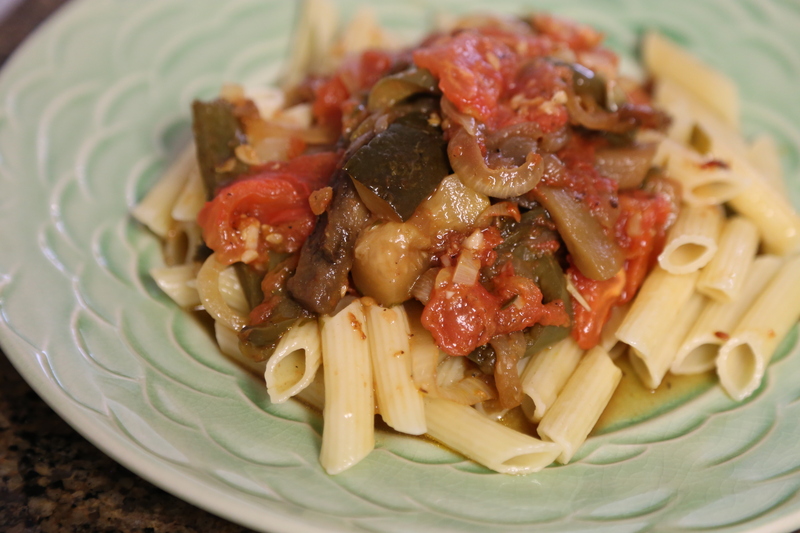 Quite versatile, ratatouille is typically served as a side dish, but also makes a lovely vegetarian entrée when paired with pasta, rice or couscous. I chose to follow Ms. Child’s recipe for ratatouille and paired it with penne pasta. Peel the eggplant and cut into lengthwise slices 3/8″ think, about 3″ long and 1″ wide. Scrub the zucchini, slice off the two ends and cut into slices about the same size as the eggplant. Place the vegetables in a bowl and toss with 1 tsp. salt. Let stand for 30 minutes. Drain and dry each slice in a towel. One layer at a time, saute the eggplant and then the zucchini in 4 tablespoons hot olive oil in a 10-12″ skillet for about a minute on each side to brown very lightly. Remove to a side dish. In the same skillet, cook the onions and peppers (add an additional 2 tablespoons of olive oil if needed) for about 10 minutes, until tender but not browned. Stir in the garlic and season with salt & pepper to taste. Slice tomato pulp into 3/8″ strips. Lay them over the onions and peppers. Season with salt & pepper. Cover the skillet and cook over low heat for 5 minutes or until tomatoes have begun to render their juice. Uncover, taste the tomatoes with the juices, raise heat and boil for several minutes until juice has almost entirely evaporated. Place a third of the tomato mixture in the bottom of a 2 1/2 quart casserole (about 2 1/2″ deep). Sprinkle 1 tablespoon. fresh, minced parsley over tomatoes. Arrange half of the eggplant and zucchini on top, then half the remaining tomatoes and parsley. Put in the rest of the eggplant and zucchini and finish with the remaining tomatoes and parsley. Recipe excerpted from Mastering the Art of French Cooking by Julia Child. Ratatouille is very popular with dieters. It is low in fat and calories, and high in nutrients. Enjoy! No one knows who made the first soufflé but Antoine Beauvilliers, chef and pioneering restaurateur who opened the first luxury restaurant in Paris in 1782, spread the word. In the late 18th century, Beauvilliers cooked for French royalty before opening his restaurant in Paris—where, according to legend, every meal included a soufflé. In a heavy saucepan over medium heat, combine the milk, sugar and chocolate. Cook, stirring constantly, until the chocolate melts, about 5 minutes. In a bowl, whisk the egg yolks. Whisking constantly, slowly pour the chocolate mixture into the eggs. Pour the egg mixture into the saucepan, place over medium heat, and cook, stirring constantly, until thick enough to coat the back of a spoon, about 5 minutes. Do not let the mixture boil. Strain through a fine-mesh sieve into a bowl. Place in a larger bowl partially filled with ice water and let cool, stirring occasionally, for about 5 minutes. Stir in the vanilla and salt. Cover and refrigerate. In a frying pan over medium-high heat, toast the hazelnuts, shaking the pan occasionally, until the skins darken and loosen, 3-5 minutes. Transfer to a towel and rub vigorously to remove the loose skins. In a food processor, process the hazelnuts to a fine powder. Set aside. Preheat oven to 375° F (190° C). Butter six 1-cup (8-fl oz/250-ml) individual dishes or one 1 ½-qt (1.5-l) soufflé dish. In a saucepan, whisk together the flour, ¼ cup sugar, whole egg, and egg yolks, then whisk in the milk. Set the pan over medium-low heat and cook, stirring constantly until the mixture begins to thicken, 4-6 minutes. Do not let it boil. Set aside ¼ cup (1 oz/30 g) of the ground hazelnuts. Stir in the remaining nuts and continue cooking until an opaque custard forms, about 2 minutes. Pour into a large bowl and stir in the brandy and vanilla. Let cool completely. In a small bowl, combine the 2 tablespoons sugar and the reserved hazelnuts. Sprinkle the mixture into the soufflé dish(es), coating the bottom and sides. Put the egg whites in a large bowl, clean bowl. Using an electric mixer on medium speed, beat the whites until foamy. Add the cream of tartar and salt and continue to beat until firm peaks form. Scoop one-fourth of the egg whites onto the hazelnut mixture. Using a rubber spatula, stir in the whites to lighten the mixture. Scoop the remaining whites on top and fold in just until no white streaks remain. Scoop into the prepared dish(es). Bake until risen and lightly flecked with gold, about 10 minutes for individual soufflés or about 20 min for a large soufflé. Serve with the chilled crème anglaise alongside. Martine’s note: I used a small food processor to process the hazelnuts. It did not yield a a fine powder so this caused the soufflé to have a bit of texture. 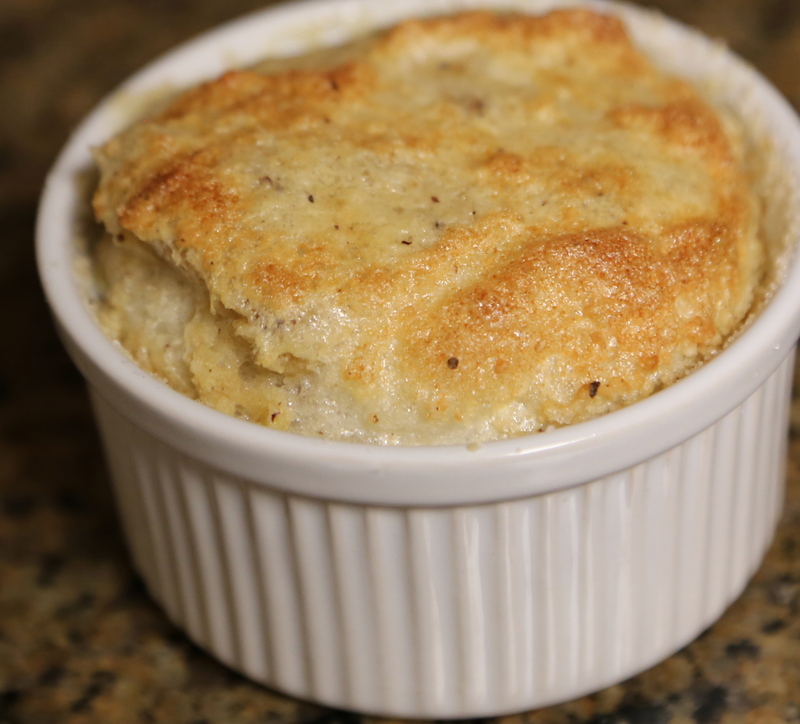 Next time I make this recipe I will use a stronger processor for a smoother soufflé. I also did not have brandy or Cognac on hand and used rum, leftover from another dessert recipe, instead. The flavor was still nice. Finally, I mixed the egg whites too early before I planned to bake them so I believe that is why my soufflé (pictured above) did not rise very much. I would recommend to wait to fold in the egg whites and bake until about 15-20 minutes before you plan to serve them. Bon Appétit! Recipe excerpted from A Taste of the World by Williams-Sonoma. Artists: Francis Cabrel, Georges Moustaki, Maxime Le Forestier, Charles Trenet, Carla Bruni, Stacey Kent, Julie London, Madeleine Peyroux…to name a few. Delicious!! Martine, the true miracle with your meals is how you prepared and cooked them all to such perfection and you have a baby!! I believe that angels may have been at work here . . .
Bravo Martine! This looks so delicious I may just have to try — Joyeuse Fête! Merci! If you decide to try the recipes and have any questions, please don’t hesitate to let me know! Bonne chance! Ratatouille vient du mot “Ratatolha” en Occitan, un dialecte provençal. A la base, il me semble que c’était un plat dans lequel on mettait les légumes (rata) qu’on trouvait et on cuisait en mélangeant (touiller). Merci pour la recette du soufflé! Audrey, you’re welcome. Let me know how your soufflé turns out. I hope its magnificent! Thank you for sharing “ratatouille’s” origin! Interesting. What a great post! I think I have actually heard of Bastille Day, surprising! You make the meal/cooking part sound too easy & delightful. I really want to try making the ratatouille this weekend! 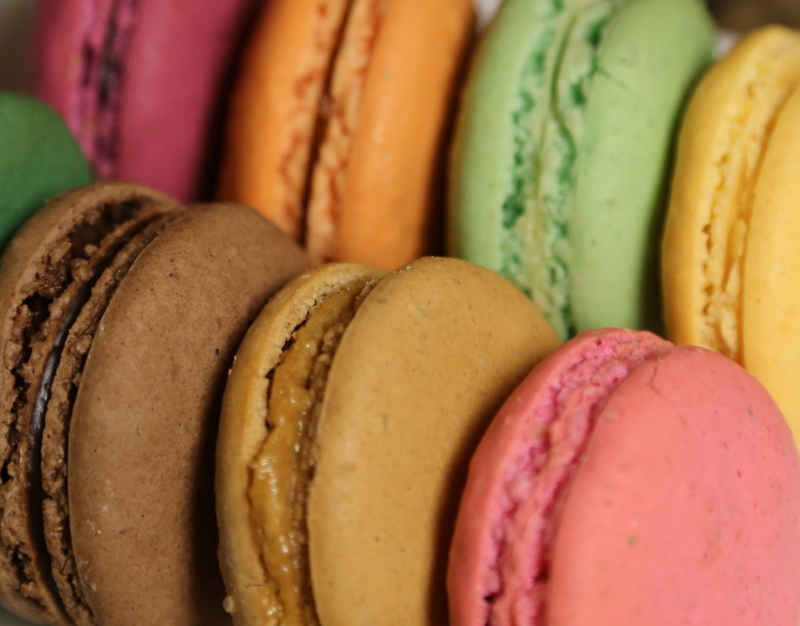 And would love to try some of those colorful French macaroons. Thx! Glad you liked this post. The meal preparation was actually fun. Lots of work but worth the time. Good luck with your ratatouille this weekend. Let me know how it turns out!